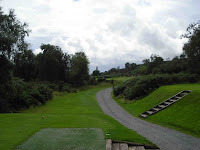 Clandeboye was another of the courses (18 hole Duffering and 18 hole Ava) that I had eagerly waited to play. About 10 years ago I worked for Esat Digifone, and in my marketing role I dealt with Johnny Packham, a Northern Irish gentleman, who runs Open Fairways (www.openfairways.com) - check it out if you don’t know that it’s one of the great ways to play golf in this country. 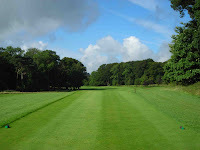 He was a member at Clandeboye and he had been very enthusiastic about the course. Unfortunately, he couldn’t make it when I was due to play, but he sent a very able deputy – Shane Darby. Now Shane is what you call one of the lucky Irish. He comes back from Oz and he decides he wants a career in golf – his passion. He saw his five years of promoting forklifts (in Ireland and Oz) as not being in anyway a problem, and he fired off an email to Open Fairways. And what do you know, one of the guys at Open Fairways had just handed in his notice and Shane fit the bill perfectly. Who says you can’t your dream job. He’s living proof. Mind you, so am I. When I arrived in the evening it was tipping down. The visitors’ car park is a little bit away from the clubhouse and I ended up staying in the camper for over an hour, waiting for the rain to ease off. 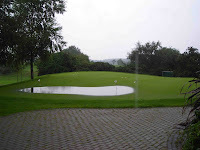 When I finally got up there the putting green was slowly sinking under water – see pic. It didn’t bode well. I half expected Shane to phone and say he was declining the opportunity. The next morning was the complete opposite – as we’ve come to expect of Irish weather – and Shane appeared at 7.30 as agreed. He’d only played a handful of times this year and here he was, about to play 36 holes, and he was carrying his clubs. On top of that he’d strained his hamstring the night before during rugby training. I was trying to figure out how I was going to carry him from the furthest reaches of the course when the time came, but as the day progressed he loosened up and had no problem getting around. 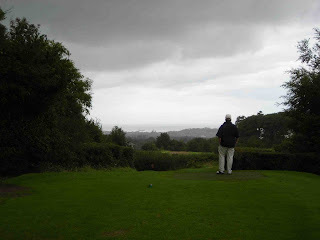 We played the big course first – the Dufferin – in an open singles competition. It had been a while since I had played in one and it always focuses the mind. We both ooh-ed and aah-ed as we went around, loving what the course had to offer. We even got to see two huge buzzards that are nesting somewhere off the 5th fairway. This is a seriously beautiful golf course that combines heathland at the top with mature parkland at the bottom. And a combination of the two in between. You have got to come and play here before Clandeboye realises that the green fees they’re asking are outrageously good value. 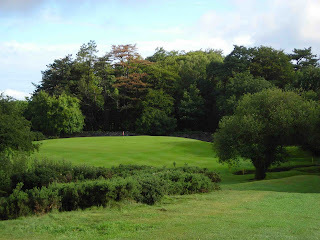 There are plenty of great value courses up here – Donaghadee and Down Royal spring to mind – but (and no offence to these two) the Dufferin course is in the top tier of parkland courses. And as for the clubhouse… huge and plush. Put it this way, how many golf club locker rooms have a sofa seating area, with TV, overlooking the course? There’s only one problem to all this: it is very easy to get lost. No really. At any one time you have about four doors to choose from. As we were leaving the bar after lunch, Shane did a classic George W Bush: he opened a door on the way outside and walked straight into a closet. Oh how we laughed. At the end of the second round on the Ava course, Shane went to walk into the pro shop and went into the buggy storeroom instead. Add to that my very circuitous (and torturous) routes to get to the bar – on several occasions – and my advice is to look for direction signs. Or just ask. After a very slow start, Shane hit the shot of the round, almost claiming a hole in one on the 14th. The ball finished just a few inches behind the hole. Mind you, his approach to 18 on the Ava course was even better because he said he was going to hit it to a foot, and he did. I tried it and ended up in the bunker. Ava is what you call a quirky course. It is short, and with so much gorse running away off the tee some holes are madness. A driver would be foolish on most of the long holes. Even on the par five 8th a driver could be foolish. The course is simply too tight and often too blind. The 17th is crazy. Stand on the tee and you have no idea where to go. Seriously, no idea at all. And 13 is not dissimilar. 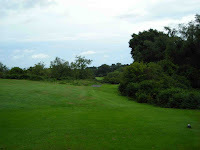 At the same time, it’s a lot of fun and the appeal of the course is huge with that lovely rich heathland feel. I was told before I arrived that I should play the Dufferin course first. Having played both, I suggest that you play Ava first – it will give you a taste of the greens, and it will sharpen your game for the main event – because the Dufferin course is most definitely the main event.